Shop online for 15 submarine russian ship models at discounts up to 32%. Hobby Boss is ranked #1 out of 6 submarine russian ship models manufacturers, followed by Zvezda, and Riich Models. This is the 1/700 scale Russian Navy Typhoon Class Submarine plastic model by Hobby Boss For ages 14 years and up. 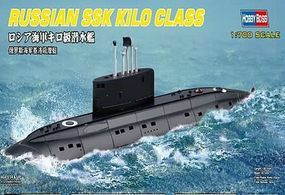 This is the 1/700 Scale Russian SSK Kilo Class Plastic Model Kit from Hobby Boss. Suitable for Ages 14 & Older. This is the 1/700 Scale Russian Navy Oscar II Class Submarine Plastic Model Kit from Hobby Boss. Suitable for Ages 14 & Older. This is the 1/700 scale Russian Navy Akula Class Attack Submarine Plastic Model Kit from Hobby Boss. Suitable for Ages 14 & Older. 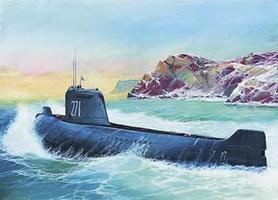 This is the 1/350 Scale Russian Navy Typhoon Class SSBN Plastic Model Kit from Hobby Boss. Suitable for Ages 14 & Older. This is the 1/350 K-19 Soviet Nuclear Submarine Plastic Model Kit from Zvezda. Ages 10 and up. This is the 1/350 Scale Russian Navy Akula Class Attack Submarine Plastic Model Kit from Hobby Boss. Suitable for Ages 14 & Older. This is the 1/350 Scale Russian Navy Alfa Class SSN Plastic Model Kit from Hobby Boss. Suitable for Ages 14 & Older. This is the 1/350 Scale Russian Navy SSGN Oscar II Submarine Plastic Model Kit from Hobby Boss. Suitable for Ages 14 & Older. This is the 1/350 Scale Russian Nuclear Submarine K-141 "Kursk' Plastic Model Kit from Zvezda. Suitable for Ages 10 & Up. 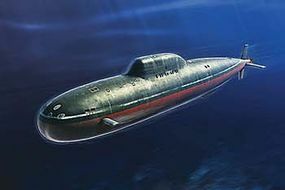 This is a 1/144 scale Soviet Kilo Class Type 636 Attack Submarine plastic model kit from Trumpeter. This is the 1/700 Soviet Admiral Nakhimov Warship & USS Dallas SSN700 Nuclear Submarine Plastic Model Kit from Dragon Suitable for Ages 10 & Older. The Warship and Submarine in one kit. This is the 1/350 Scale Soviet Navy Victor III Submarine Plastic Model Kit from Hobby Boss. Suitable for Ages 14 & Older.